Before I can share those ideas effectively, though, I need to do some theology. The scriptures, clearly and repeatedly, teach that Christ will raise the dead. And some have supposed that to mean that they shouldn’t do anything except verbally affirm their trust in Christ. But our scriptures also teach that trust without action is dead. And in this case, that’s as literal as it gets. Without action, the dead stay dead. So whose action will it be? Presumably, Jesus could tell us to relax. After all, the Bible says he raises the dead three times before God raises him and many others from the dead. But he doesn’t tell us to relax. Instead, Jesus commands us to "raise the dead." As precedent, in the Old Testament, Elijah and Elisha raise the dead. 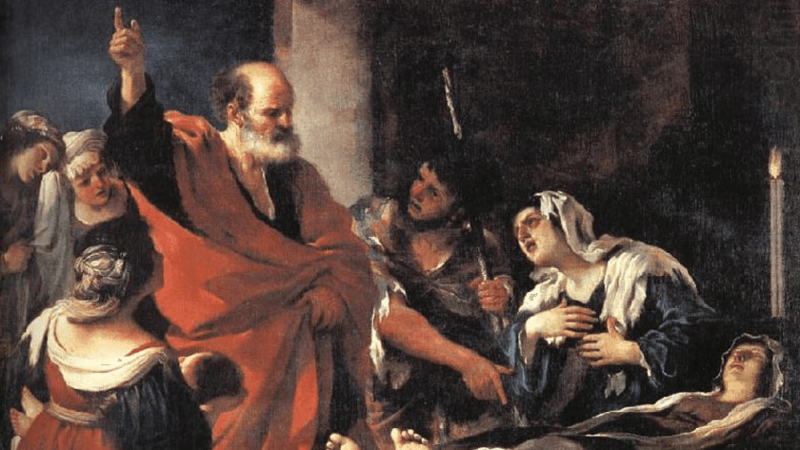 In the New Testament, Peter and Paul raise the dead. And in the Book of Mormon, Nephi raises the dead. Of course that makes perfect sense because Jesus also commands us to take the name of Christ, do the works he’s done, and even greater things. So the scriptures do teach that Christ will raise the dead. But those who’ve supposed that verbal trust is sufficient are wrong, because the scriptures also teach that Christ will raise the dead through us. "[Do you] suppose that [you] could sit [on] your thrones, and because of the exceeding goodness of God [you] could do nothing and [God] would deliver you? ... Or do [you] suppose that [God] will still deliver us, while we sit [on] our thrones and do not make use of the means which [God] has provided for us? ... If [you] have supposed this [you] have supposed in vain." The Bible says that we’ll reign with Christ and judge the world during the resurrection. It also says that we won’t all die, and the living will change. Joseph Smith said that we’ll perform the ordinance of transfiguration to make each other immortal in what he called the "last times." Brigham Young taught that, when immortal, we’ll perform the ordinance of resurrection for our dead friends and family. And Joseph characterized that time, when we “attain to the resurrection of the dead,” as the time when we become Gods, the same as all other Gods have done before. As I mentioned at the beginning, I think we’ve already started to raise the dead. And here’s how. I call this thought experiment "Resurrection by Family History." A historian develops a model of a dead person. Another historian improves the detail and accuracy of the model. Other historians repeat #2 indefinitely, recursively improving the detail and accuracy of the model. This has been happening for at least thousands of years. Ancient models were stories and pictures. Modern models added audio and video. Emerging models have extended to biometrics and simulation. And future models may incorporate data that we mine from the depths of time through what science fiction has called "quantum archeology." Given enough time, the natural consequence of our history project may be models that are practically indistinguishable from the persons who were dead. In other words, the natural consequence of our history project may be their resurrection. "In recent years we have begun using information technology to hasten the sacred work of providing ordinances for the deceased. The role of technology in this work has been accelerated by the Lord himself, who has had a guiding hand in its development and will continue to do so. However, we stand only on the threshold of what we can do with these tools. I feel that our most enthusiastic projections can capture only a tiny glimpse of how these tools can help us — and of the eternal consequences of these efforts." So here’s my enthusiastic projection – my tiny glimpse of how these tools can help us. Imagine a superintelligent historian. Using the tools of quantum archeology, she traces backward through time and space from effects to causes. Sampling a sufficiently large portion of her present, she attains a desired probabilistic precision for a portion of her past. The result of her computation is a highly detailed, highly accurate model of you. The future-you is distinguishable from the present-you, but no more so than the today-you is distinguishable from the yesterday-you. You are resurrected. As we imagine the eternal consequences of these efforts, some philosophical objections may haunt us. I know they’ve haunted me. But Jesus also commanded us to cast out devils. So in that spirit, let’s see if I can quickly exorcise six of them – seems like the number for devils. Objection 1: Jesus didn’t use technology to raise the dead. You don’t know that. Maybe you just don’t see anything that you recognize as technology in the depictions of Jesus raising the dead. My father died over 20 years ago. I tried praying for his resurrection. It was probably a good start, but it wasn’t sufficient. He’s still dead, so far as I know. And I’m pretty sure that holding a picture of Jesus over his tomb, or standing like Jesus with my hands raised in the air, won’t be sufficient to resurrect him either – although those actions, like the stories and pictures, may also function as motivating prayers. Something else is required. And just because technology isn’t obvious doesn’t mean it’s absent. After all, we already live in an age of invisible technology. Objection 2: Technological resurrection assumes that the body creates the mind. No. It doesn’t. Technological resurrection is compatible with that hypothesis. But it’s also compatible with other hypotheses. For example, it may be that the body individuates, concentrates, or channels mind from some pervasive or external source. Technological resurrection requires only correlation between body and mind. And it’s perfectly compatible with a belief that spirit is matter, like Joseph Smith taught, but independent from any particular body. Some Transhumanists call that a substrate-independent mind. Objection 3: The resurrected body wouldn’t really be mine. By that reasoning, the body you have now isn’t really yours. You don’t have exactly the same body that went to bed last night – let alone the same body that your mother birthed. Resurrection doesn’t require exactly the same body. It requires only whatever is psychosocially sufficient for individual and communal identity. In other words, if you’re comfortable identifying with your changing body throughout life, you should be comfortable with technological resurrection. Objection 4: The mind in the resurrected body wouldn’t really be me. By that reasoning, you might not be the person you think you are right now – which of course makes no sense. But seriously, you haven’t experienced and you don’t remember a perfect continuity of consciousness throughout your life – let alone whatever might have transpired before. Resurrection doesn’t require conscious continuity. Again, it requires only whatever is psychosocially sufficient. If you think you’re still you after full anesthesia, you should be comfortable with technological resurrection. And in any case, you wouldn’t know the difference. Objection 5: Technological resurrection would require a computer larger than our universe. No. It wouldn’t. Resurrection doesn’t require every detail of the universe, our world, or even our bodies. Once again, it requires only whatever is psychosocially sufficient. All humans combined, past and present, have only ever known a tiny fraction of the information of which we and our world consist, and we’ve cared about even less. If you’re not losing sleep over the precise number of prehistoric mosquitoes or the spacetime coordinates of your gut bacteria, we wouldn’t need to calculate those details. And if that doesn’t feel right, we can expand to whatever does, and it would still be only a tiny fraction of the universe. Objection 6: Technological resurrection could enable multiple copies of me. Yes. It could. And those copies could go on to have individuating experiences and separate identities. Maybe you’re already a copy of God that individuated. We could call that your "spirit birth." In any case, it’s not clear that the potential for copies is inherently bad. But it could be abused, so we would probably need to establish and enforce laws related to identity – perhaps the Gods already have. That reminds me of Brigham Young’s repeated claims that eternal life is the power to preserve your identity. Maybe he was on to something.